Sanibel Sea School’s sand dollar research team uses a stand up paddleboard to transport their gear. Most people think of paddle-powered vessels as recreational equipment, but these relatively slow, quiet boats with little to no hull draft can also be useful for scientific research. Whether scientists are working in shallow areas or trying not to disturb the wildlife they are studying, kayaks and paddleboards have their benefits. Last year, a group of biologists traveled via stand up paddleboard to look for smalltooth sawfish in and around San Carlos Bay. The habitat use of these creatures is not well understood, and sightings are rare, so every sighting can provide new and useful information. Standing up on a paddleboard creates minimal disturbance and provides a clear view into the water, so it is an excellent position for spotting marine life. If you are out paddling and you spot a smalltooth sawfish, note the date and time, the approximate length, the water depth, location, and any other details you observe – this can be contributed to the Florida Fish and Wildlife Conservation Commission’s ongoing study. 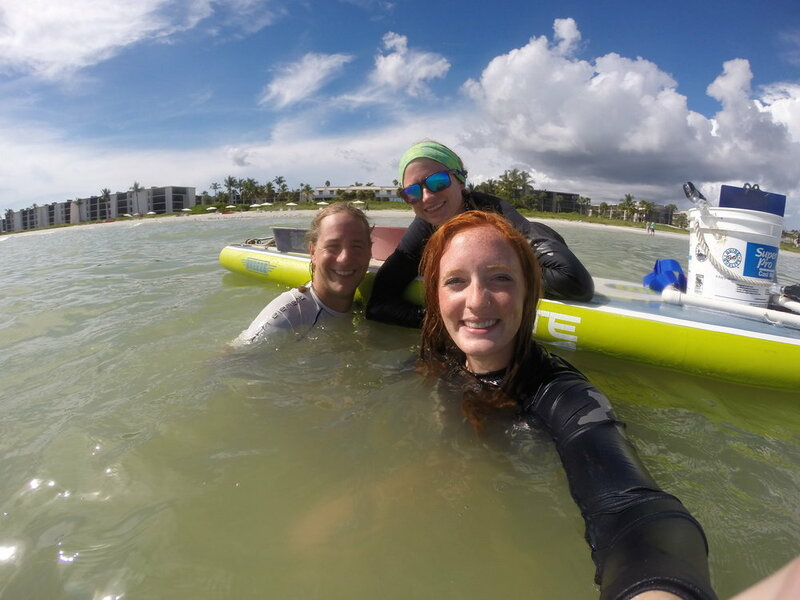 At Sanibel Sea School, the sand dollar research team uses paddleboards to transport equipment through shallow water. The work takes place primarily on sandbars, and heavy dive gear is required. The paddleboard also offers a perfect floating work surface to measure the organisms and record data. Researchers on the Pacific coast have used cameras mounted under kayaks to capture footage of juvenile great white sharks close to shore. The videos allow them to identify individuals based on specific features, record multiple sightings, and learn about the sharks’ behaviors and movement patterns. If you would like to learn about more opportunities to participate in paddle-based citizen science projects, stay tuned for an upcoming column on that topic.